Larry Joe Bird , an American retired professional basketball player played for the Boston Celtics of the National Basketball Association (NBA). Bird started at small forward and power forward for thirteen seasons, spearheading one of the NBA's most formidable frontcourts. "Push yourself again and again. 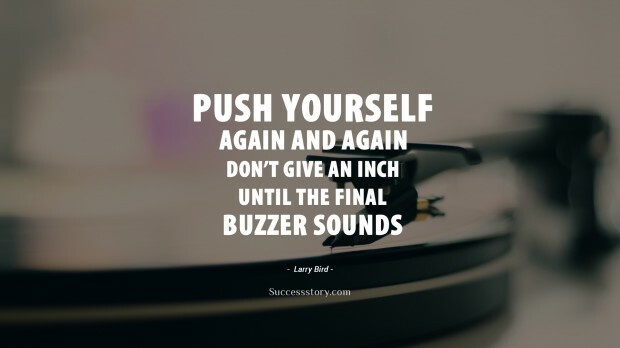 Dont give an inch until the final buzzer sounds." 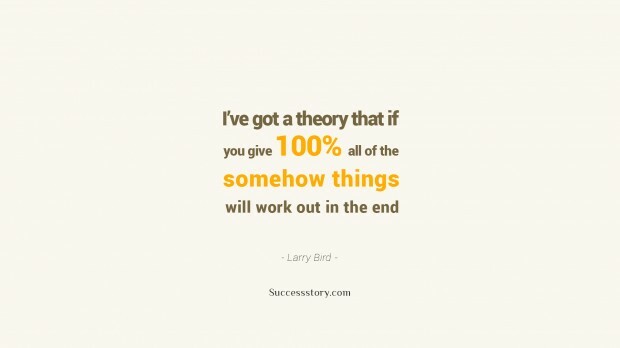 "I've got a theory that if you give 100 percent all of the time, somehow things will work out in the end"
Larry Bird Quotes are mainly a description of how Leadership guides the efforts of the team towards success. The motivational quotes suggest getting each member involved to enable release their best available strengths to achieve the desired results. He suggests that Leadership is diving for the loose ball, getting the crowd involved and getting other players involved. That's the only way you're going to get respect from the players. His main aim and objective is to ultimately make due 100% efforts for achieving success by gaining confidence of your team which will positively impact the performance as a whole. Eventually it is the Team effort that leads to success. The wonderful thoughts are meant to create a winner by recognizing one’s God given talents and by working hard to develop them as skills and then to use these skills to accomplish one’s Goals. There should be no false representation as everybody will sooner or later see through a phony Leader. Leadership means qualities such that an all round trust is developed with the team which ultimately will lead to super performance. So it is Leadership which does play the most important role for any team to reach success . If you expect others to give their full , you should lead them by giving your own full.